I have heard about people making banana ice cream, but I’ve never actually tried it until now. I mean… I will admit that I do not like the taste of bananas… at all, but I have a kid that eats them everyday. So I decided to give this ice cream experiment a try. It turned out awesome. Even though I don’t like the taste of bananas, this was good! I ate some and my daughter devoured it like it was real ice cream. My husband loved it too. 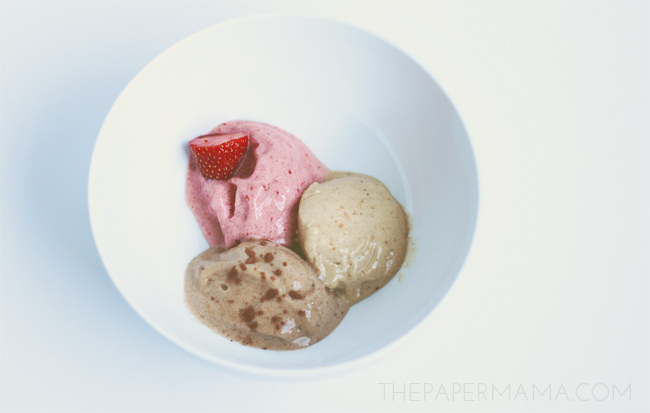 If you have some overripe bananas, this ice cream trick is for you. Below I’ve shared the 3 different recipes I tried. It’s so simple. The best thing about this recipe is my daughter thinks she is actually eating ice cream! Ha! This mom wins! – Place all the ingredients in a food processor. Blend until all the bananas and ingredients are blended and smooth like soft serve. Note: you really do need a food processor for this recipe. You can use a blender, but it just won’t come out with that smooth ice cream texture. – Place each Banana ice cream into a separate container and freezer for about 2 hours. Seriously give this a try. My kiddo lived the strawberry best, while my husband preferred the peanut butter. I’m always a cocoa girl… So that was my favorite (especially with the little hint of cinnamon). If you try this, let me know. So good. P.S. I’ve seen these recipes all over the web, but I loved the combos I found on The Kitchn. Yum!! You make it look pretty! I've made these a lot in the past but it's been too long!! YUM! 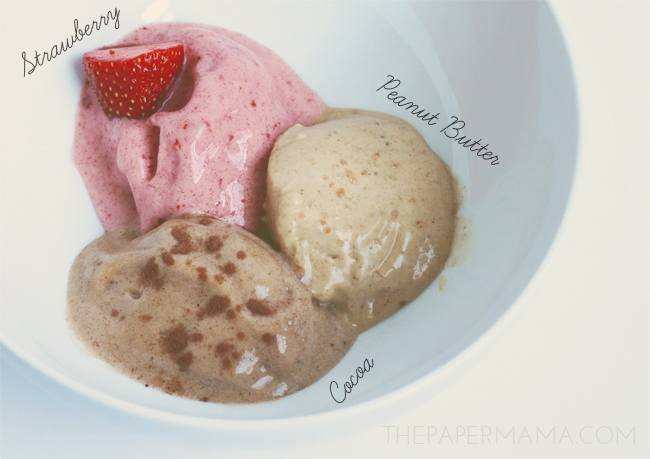 I've only had plain banana "ice cream," but I'll have to give these flavors a try! Ours have been frozen for 48 hours and are still good. Yay! These sound amazing. 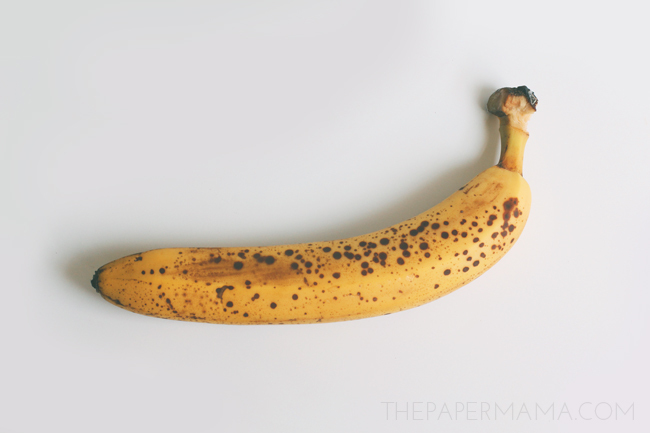 We're banana freaks over here so this is perfect. Did you use the bit of sea salt? honey?